You’ll commit an old-fashioned faux-pas by stepping out of the house without a vest. Our Sable Brushed Cotton Vest prevents the unseemly image of showing (gasp) one’s bare shirt in mixed company. Avoid any awkward situations and welcome the style this must-have piece of vintage men’s fashion brings. Made of velvety soft brushed cotton, this waistcoat features a flat front, notched collar and plenty of pockets for a trolley token, spectacles or other small furnishings. Part of our matched Sable collection and available in different colors. The front fastens up with five buttons and the back adjusts with a tab belt. Imported. Body and lining are made from 100% cotton. Self backed for extra style. Professionally dry clean only. Available in sizes S - 3X. Though the vest is old design it’s looks great with jeans or wearing to work. Fits well. Good quality. Will be buying another one. This is a well made vest. The material is a heavy duty cotton and feels like very soft canvas. I gave it 4 stars only because of the plastic buttons. They are heavy duty buttons, but I would have paid more money for a vest with buttons that were more period correct (such as wood or another natural material). Also, the tag on the vest says "Gunslinger Vest" and the brand on the label is Frontier Classics. So it is designed as a western style vest. 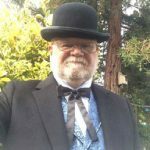 I was wanting something in a Victorian style to wear with my bowler hat, but it will also go well with my western hat. I ordered a size Large and it fits true to size. I wear a size 42 suit and it was a little big, but was able to adjust it down to my size with the tab belt on the back. Plenty of pockets. Quality is spectacular and the shipping is as if I walked into the store and purchased it, delivery from the west coast was quick like I've never seen. Customer service top notch, size of clothing was as described. Best to get one size larger as with all dress clothes due to the high waist. Best clothing company ever!! Great fit and quality. Very comfortable. This is one of my favorites. I wear it often to work. This is a great quality, great-looking vest. Sewing quality is outstanding. The material is thick and soft. Buttons are quality, too. I normally would fall into the Large sizing, which I ordered initially, but had to re-order a Medium, which fit perfectly. Wearing this vest is not only comfortable, but remarkably historic. I have only received compliments when I wore it - everyone has asked me more about it, and I've told them right away about the Emporium. Works superbly with a cravat and a pocket watch. Hopefully, one day, the mainstream fashion can return to this golden age! We can only try. Just what we needed for our wedding. We were looking for a vest for my (now) husband. We finally found the right one on the site. We bought 2 sizes as we didn't know which would fit best. We chose the smaller one and returned the larger one. We had a family member take in the vest a bit because it was still a little big, but there is no way my husband would be comfortable in the next size down. All in all the vest was just what he was looking for and he looked great at our wedding! Excellent fit for me, look great, well constructed. What more can on say? I would recommend, especially with matching trousers. I look particularly dapper in these at work. I really like how this can fit into almost any earth tone outfit. Works with tans, olives and browns. The only drawback is the shorter "gunslinger" flat front doesn't work on me as well. However it seems to be very sturdy with strong buttons. Handsome more help on the sizing chart would be appreciated. I think men are getting bigger (sorry) and so what used to be a med could be a large? Anyway it was a birthday gift much appreciated. The vest is great! Even better quality than expected, fast shipping, fair price, awesome style, and just plain and simply great! Very nice, exactly what was needed for my daughters wedding!